Valuation practitioners tell BVWire they are already seeing an increase in valuation engagements triggered by the proposed Section 2704 regulations (prior coverage here). And they expect this to gain steam as the regs continue to sink in with attorneys, wealth planners, and clients. This is by no means a scientific poll, merely the result of conversations with practitioners we talk with continuously. Under the wire: The proposed regs seek to curtail valuation discounts on transfers of interests in family entities. Letters we’ve seen from wealth planners, law firms, and other advisors are urging clients to plan before year-end when these new rules could become effective. This harkens back to 2012, when the reduction in the estate tax exemption triggered a year-end rush of estate plan activity before the change took effect. Of course, it could take months or years to finalize the regs—and they may never see the light of day in any shape or form. But advisors are proceeding as though the regs will be finalized as proposed. Another issue to consider is the upcoming presidential election. If Donald Trump is elected, he proposes to eliminate the death tax. Of course, just because a president proposes it doesn’t mean that it will happen, points out former IRS manager Michael Gregory (Michael Gregory Consulting LLC), during a recent interview. If Hillary Clinton is elected, she plans to reduce the estate tax exemption to $3.5 million and increase the tax rate from 40% to 45%. “With that decrease in the exemption, it would roughly double the number of estates subject to tax, from 0.2% to 0.4% of all estates,” says Gregory. While that number is still small, it represents a significant amount of tax, especially with the increase of the tax rate to 45%, he says. But, with proper planning, “it’s quite possible to reduce that using vehicles including minority interest discounts along with other planning tools to minimize that tax,” he says. In any event, it’s important for the profession to submit formal comments by the November 2 due date. Details on how to submit comments are in the proposed regs, which you can download here. A public hearing will be held at the IRS in Washington, D.C., on December 1. BVWire will be there! Extra: Learn more during our September 29 webinar with Curtis Kimball (Willamette Management Associates): The IRS’ Proposed Section 2704 Regulations: The Impact on and the Future of Estate and Gift Valuation. A recent ruling in a complex bankruptcy case teaches that Daubert can accommodate differing views on determining solvency for multiple debtor entities. Consolidated vs. stand-alone basis: A group of related family-run consumer lending and retail businesses filed for Chapter 11 bankruptcy. The plaintiff, representing the debtor enterprises, sued the defendants, alleging certain transactions were avoidable fraudulent transfers. For recovery purposes, the ultimate question was whether the debtors were insolvent at the time of the transfers. Both parties retained experienced experts who held strong, opposing views on how to find the answer. They disagreed on whether to determine solvency on a consolidated basis or on a stand-alone, subsidiary-level basis; whether GAAP-based financials were an appropriate basis for the determination; and whether upward balance sheet adjustments were defensible under the facts of the case. Both sides filed Daubert motions. And the court was willing to take a generous view of reliability. It let in most of the expert testimony, leaving it to the adversarial process to discover which solvency opinion was more credible in terms of the ultimate question. The case is Post-Confirmation Comm. for Small Loans, Inc. v. Martin, 2016 U.S. Dist. LEXIS 44270 (March 31, 2016). A case digest and the court’s opinion are available at BVLaw. Deficiencies in auditing fair value measurements were identified in 44% of the audits reviewed by the PCAOB, according to its recently released annual report on its interim inspection program for auditors of brokers and dealers. During 2016, the PCAOB plans to perform inspections of 75 firms covering portions of approximately 115 audits and the related attestation engagements. This is part of an interim inspection program, but the PCAOB may make it permanent. Where there’s smoke, there’s fire. Business appraisers, along with accountants, attorneys, and investors, are all paying attention to legal marijuana, which has become serious business. It’s estimated that sales of legal marijuana in 2016 will grow to $7.1 billion, an increase of 26% over 2015. If the momentum toward legality includes all states by 2020, U.S. retail marijuana sales could reach $35 billion. This is according to a new guide, What It’s Worth: Value and Business Challenges in the Budding Cannabis Industry. Risky biz: Because the industry is so new, there are very few reliable benchmarks or historical cash flow information, so it requires the application of a discounted cash flow analysis based on projected performance. For an established industry, an investor might be content with a 20%-to-25% return. But in the cannabis industry—with the regulatory oversight of federal, state, and municipal authorities and leasing, banking, cash, and security issues—the investor might be looking for a 40%-to-50% return. News emerges every day about the changing laws and guidance from accrediting organizations and the government. The new guide’s contributors, Ron Seigneur (Seigneur Gustafson LLP) and Jim Marty (Bridge West CPAs and Consultants LLC), both of whom are practitioners based in Colorado, one of the first states to legalize adult recreational cannabis, covered these issues. When using comparable data in valuation, establishing comparability is of the utmost importance. In other words, guideline firms should be similar in their products, business models, and assets. Typically, a valuation professional would proceed by industry sectors, but caution is needed. A sector is like a drawer: It may contain identical items, or it may be a junk box. Sector snapshot: Take fashion retail, for example. Traditionally, a fashion retailer was a multibrand store-based retailer. But, over the last 20 years, different business models emerged. First, monobrand fashion verticals such as H&M, Zara, and Abercrombie made inroads. Later, pure-play e-commerce retailers arrived on the scene. A sector snapshot from MARKABLES (see chart below) looks at brand value multiples of 75 fashion retailers in three different subsectors acquired between 2005 and 2015. Some of the prominent brand names included in the sample are Saks Fifth Avenue, Burlington Coat Factory, Express, PEP, zulily, HauteLook, or Net-a-porter. The results illustrate that the three subsectors are in fact very different. While brand has a similar relative importance for all three groups (about 30% of enterprise value), appropriate royalty rates are twice as high for the “younger” subsectors (about 4% vs. 2% on revenues). 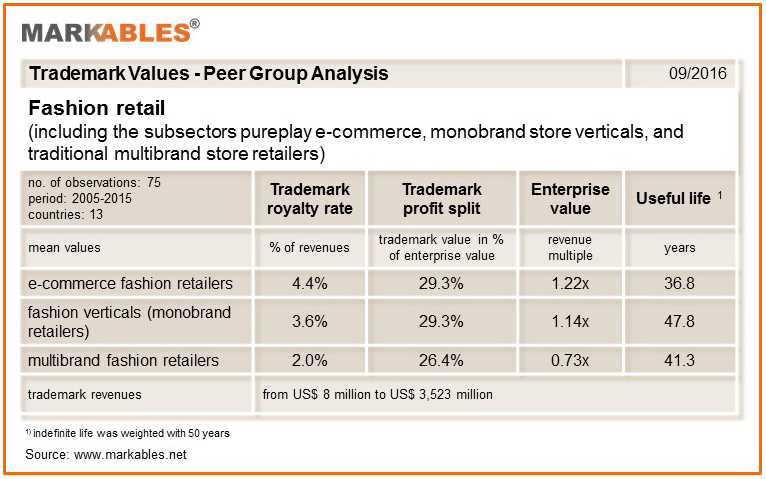 E-commerce fashion retailers show the highest brand value multiples in all different aspects. As a takeaway, guidelines entities and comparable transactions must be thoroughly researched in order to come to robust conclusions. The quality of the outcome depends on database size and applicable search filters. MARKABLES (Switzerland) has a database of over 8,200 global trademark valuations published in financial reporting documents of listed companies. Keynote addresses by Shannon Pratt (Shannon Pratt Valuations) and Neil J. Beaton (Alvarez & Marsal) highlight NACVA’s International Business Valuation Conference in Toronto September 26-28. This conference is one of a series of regional specialty conferences presented by NACVA. There will also be a full-day session, Current Update in Valuations, with Garth Tebay (Headwaters SC Valuation Services LLC and Value DefinedTM) and a two-day session on report writing, presented by Lari Masten (Masten Valuation). Other session topics include transfer pricing, valuing international entities, global intangibles, influence of the U.S. valuation picture on Canadian valuation practices, valuing oil and gas interests, linking the market and income approaches, cost of capital, and others. “Hotel Valuation: Breaking the Rules—But Getting it Right!” (Franz H. Ross). This article explains why the dominant method for the appraisal of hotels is contrary to the main methods used for the appraisal of other real estate-centered enterprises (RECEs) and is therefore flawed. “Proposed Sec. 2704 Regs Fly in the Face of BV Theory and Tax Law” (Ronald D. Rudich). A discussion of some of the many issues that need to be extensively discussed and researched before the controversial proposed regs for estate tax valuations can be enacted. “Exclusive Survey: Most BV Firms Expect 2016 Revenues to Top Last Year” (BVR Editor). Preliminary results from BVR’s Firm Economics Survey conducted during June and July of this year. “PPA-Style Method Helps Fine-Tune Estimate of Personal Goodwill” (BVR Editor). A twist on traditional methods for carving out personal from enterprise goodwill. “The Valuation of Restricted Stock Grants Based on Total Shareholder Return” (Robert Barnett). This article focuses on a specific form or market condition that is only available to a public company called total shareholder return (TSR) or relative total shareholder return (rTSR). “Experts Reveal Details of the Business Valuation Market in India” (BVR Editor). An interview with three valuation practitioners from India. To stay current on business valuation, see the October issue of Business Valuation Update. BVR is pleased to offer three new titles from our partner, The Healthcare Intelligence Network. If you value healthcare entities and/or healthcare compensation, check these out: Healthcare Trends & Forecasts: Performance Expectations for the Healthcare Industry, 2016 edition; Physician Reimbursement in 2016: 4 Billable Medicare Events to Maximize Care Management Revenue and Results; and Profitable Value-Based Reimbursement Models: Lessons from Early Adopters. Nuances in the Valuation of Service Line Joint Ventures in Healthcare (Jason Ruchaber). Other topics to be covered are goodwill (several sessions), IRS job aids, medical practice valuations for divorce, a replacement for valuation spreadsheets, and more. Get a discount: BVR has arranged special discount codes you can use when you register. The codes are: 16BVR (a $50 discount for a one-day specialty conference registration) and 16BVR2 (a $100 discount for a two-day specialty conference registration). Both codes expire Dec. 7, 2016. Please jot down the codes for when you go to register, which you can do if you click here. Want to learn about M&A transactions from the pros? BVR partner Transaction Advisors is presenting its Chicago M&A Conference on September 29 at the University of Chicago Gleacher Center. You’ll hear perspective and practical insights on the latest strategies for evaluating and structuring corporate transactions. Sessions include Pre-Deal M&A Strategy, Navigating the Capital Markets, Buying Innovation, Cross-border M&A, Innovation in Closing: Agreeing on Equity Value, Transaction Governance, and more. Take a look at the agenda here. Space is limited! Discount offer: When you register, use special code BVRGuest at checkout for $100 off the registration price. People: Ryan Maes was promoted to ABAS manager at Haskell & White of Irvine, Calif. … Stefano Vranca has joined Marcum LLP’s national forensics practice group as principal-in-charge of the California Region Advisory Services and will be based in Los Angeles. Firms: BDO USA LLP, one of the nation's leading accounting, tax, and consulting firms, and one of southern Florida’s largest firms, Goldstein Schechter Koch (GSK), merged in August. All of GSK’s employees have joined BDO … Citrin Cooperman added the Providence, R.I., firm LGC+D, LLP on September 1, marking Citrin Cooperman’s third New England acquisition this year. All of LGC+D’s 60 employees, including partners, professionals, and support staff joined the firm … In an effort to expand its Alabama footprint, Jackson Thornton of Montgomery, and one of the leading firms in the Gulf Coast region, merged with Brantley, Boucher & Farr LLP, based in the Auburn-Opelika area … REDW LLC, based in Albuquerque, N.M., and one of the Southwest’s 10 largest CPA and business consulting firms, has partnered with the Phoenix-based consulting business James C. Sell PC to expand its valuation, forensic, and litigation services practice … Sikich LLP, based in Naperville, Ill., has landed on the 2016 “Inc. 5000 List” for the fourth year in a row. NEW DATE: Report Writing: Do’s and Don’ts (September 22), with Stuart Weiss (Stuart Weiss). The IRS’ Proposed Section 2704 Regulations: The Impact on and the Future of Estate and Gift Valuation (September 29), with Curtis Kimball (Willamette Management Associates). Manufacturing Companies: Assembling the Valuation Components (October 4), with Kevin Janke. Valuing Trained and Assembled Workforces in Healthcare Provider Entities: A Deep Dive (October 13), with Timothy Smith and Angie Smith. This is Part 6 of BVR's Special Series presented by the BVR/AHLA Guide to Healthcare Industry Finance and Valuation.